The pics of the young monks with the toy gun does surprise me. I would think that behavior would be frowned upon. I have a lot to learn! 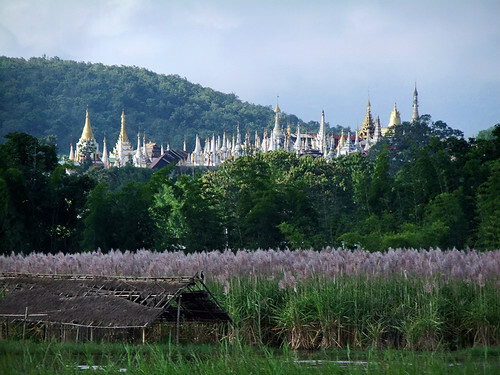 From a distance the temple on top of the hill looks like a vision of Shangri-La. Mr. Win herded us through the market and then we followed some village women up the many stairs that lead up to the fantasy on the hill. Up close it looked older, and more run-down. 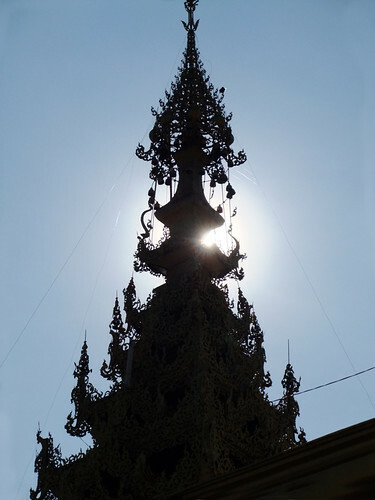 The workmanship was still beautiful though. 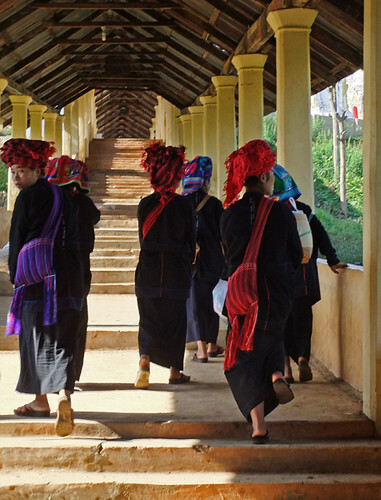 Some hill tribe women just up from the market waited for their men to arrive before the group headed off up a trail. 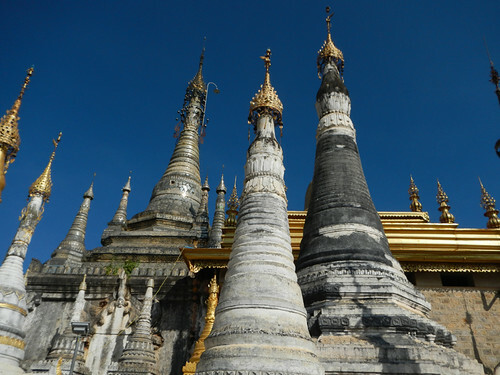 By now it was approaching the hottest part of the day, when most Burmese seek shelter in the shade. This little boy monk had some electronic game that he was playing. 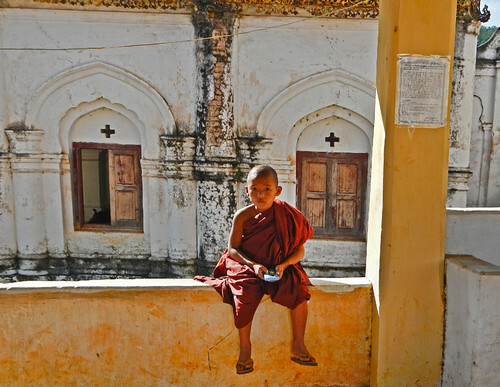 These young monks were relaxing in the monastery, one of them clutching a toy gun. 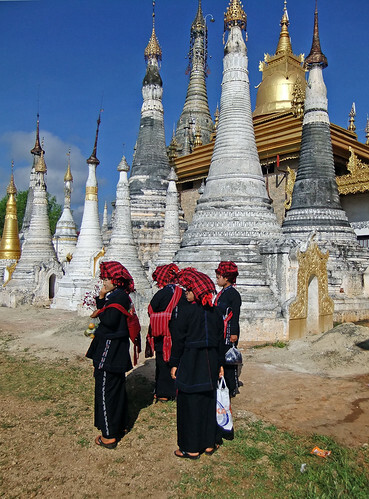 Other child monks ran about pretending to shoot each other with toy guns. Their appearance fit my every romantic notion. Tall, lithe, ebony bodies with elongated limbs, sheathed in bright colored fabric. Short cropped hair on perfectly rounded heads with stretched earlobes. Stunningly beautiful women, weighed down by intricate bead jewelry, who wouldn’t look out of place on the cover of Vogue. Their posture ramrod straight. Their gait almost insolent. But their weary eyes spoke a different story. We were welcomed with a traditional dance, escorted around their Boma, invited into their homes. The welcome felt superficial. Tacky even. The resentment of a proud warrior race reduced to performing for tourists was palpable. Or perhaps I was being over sensitive. Perhaps the reality of their lives clashed too much with the imagery in my mind. Of the majestic, free roaming, iconic symbols of wild Africa. This handsome guy greeted us at the entry to the museum. Got to love those glasses. 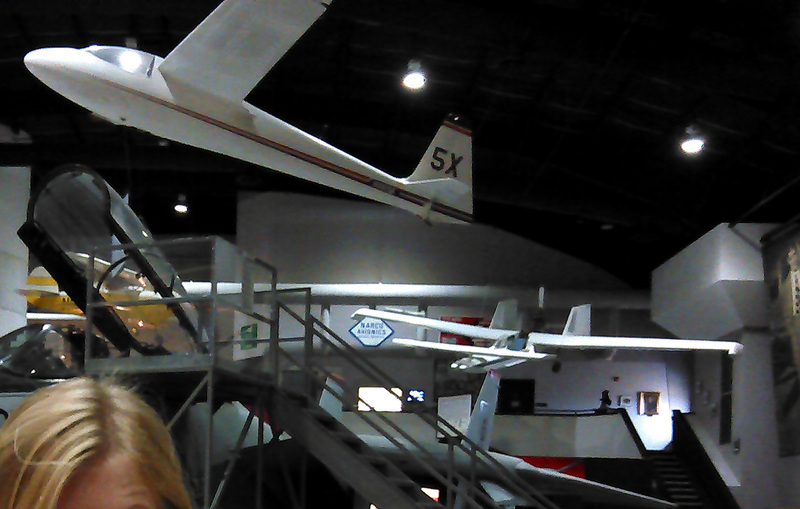 If you have a son (or grandson, in my case), who loves planes, this is the place to go. The Tulsa Air and Space Museum has made a lot of changes over the past few years, and they are for the better. The museum is clean, the displays are well-thought out, and it offers a variety of hands-on activities. This is definitely not your “look-but-don’t-touch” type of museum. The TASM is housed in an aircraft hanger close to the Tulsa International Airport. The displays are impressive: an F-15 Tomcat, a space shuttle replica, a robot arm which you can manipulate, a “smoke filled” balloon, a Spartan NP-1 ( crank start airplane) and several engines, including a mass produced jet engine. Our favorite was the shuttle spacecraft replica which you could launch. There was even a mock systems check with a control board. According to the Tulsa Air and Space Museum website, “The Tulsa Air and Space Museum & Planetarium (TASM) is a regional leader in the promotion of science-based education through hands-on interaction and discovery. Combining preservation with inspiration, TASM tells the story of Oklahoma’s rich aerospace history with interactive exhibits that educate and entertain visitors of all ages”. The employees or volunteers we met were military veterans, former or present pilots, who loved to share their enthusiasm and knowledge with us. 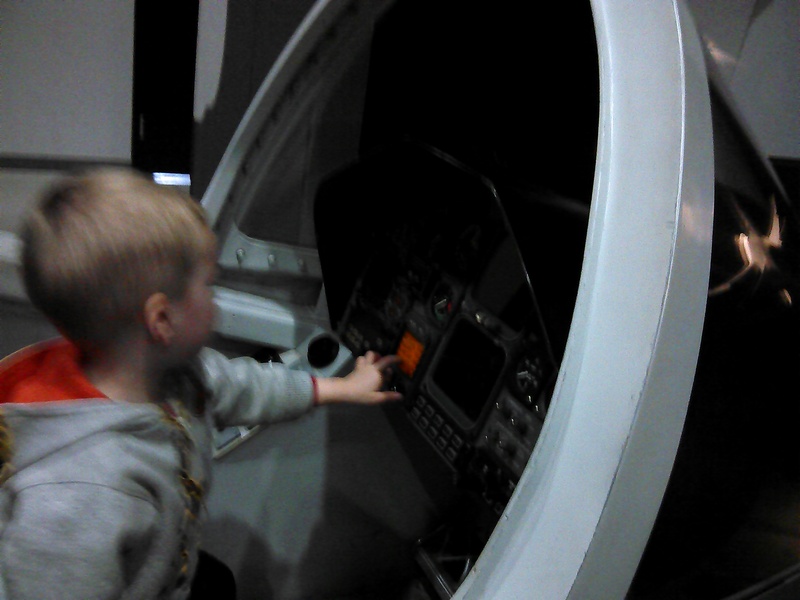 My grandson loved the airplane cockpits where he could sit and pretend to be a pilot. 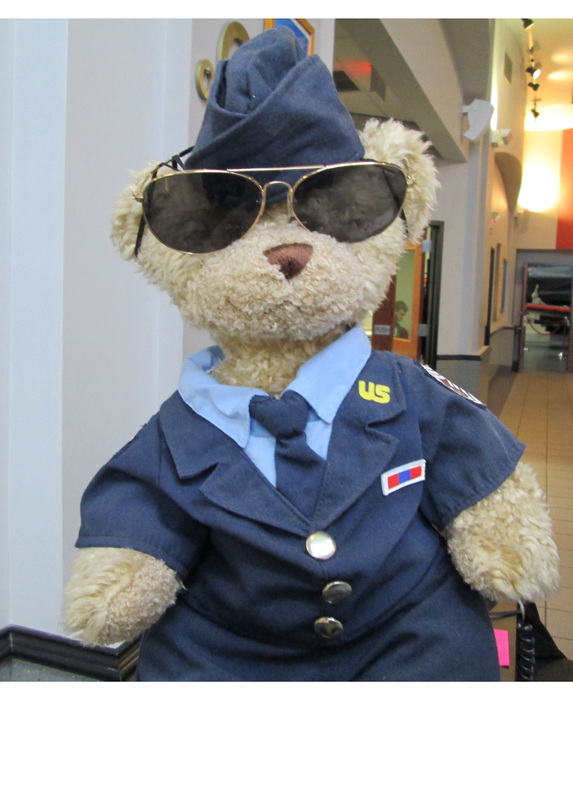 There are also displays where you can learn about aerodynamics, the history of aviation and so much more. My 11 year old daughter loved the computer simulation of flight the best. The whole exhibit can be seen in just an hour or two, depending on how much time you want to spend on each exhibit. They also offer a planetarium experience which we missed this time, but is well worth the visit, as long as your children can sit still for about 30 minutes. If you live in the Tulsa area, be sure to check out their educational programs. We will be going back again soon. 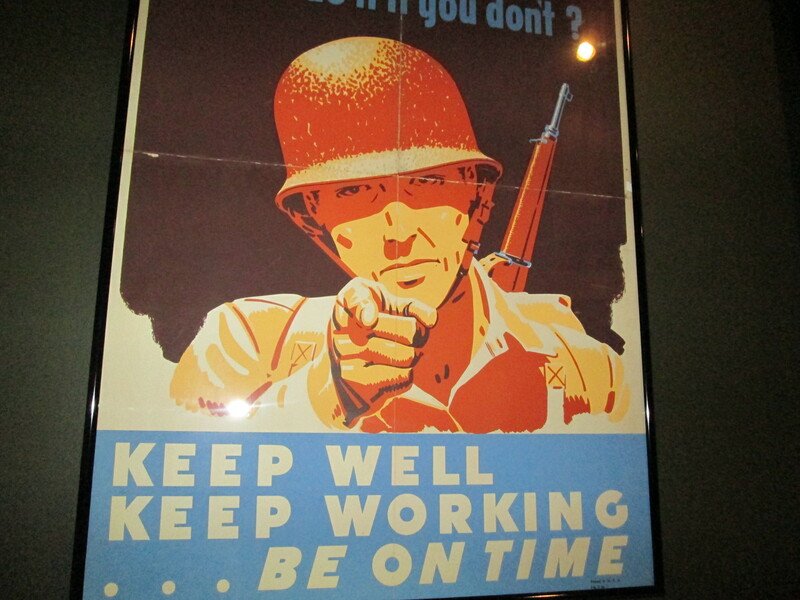 A replica of a wartime poster. That is the F-15 tomcat in the background. Very impressive. This adorable sign seems to be a replica of one you would find in South Africa. 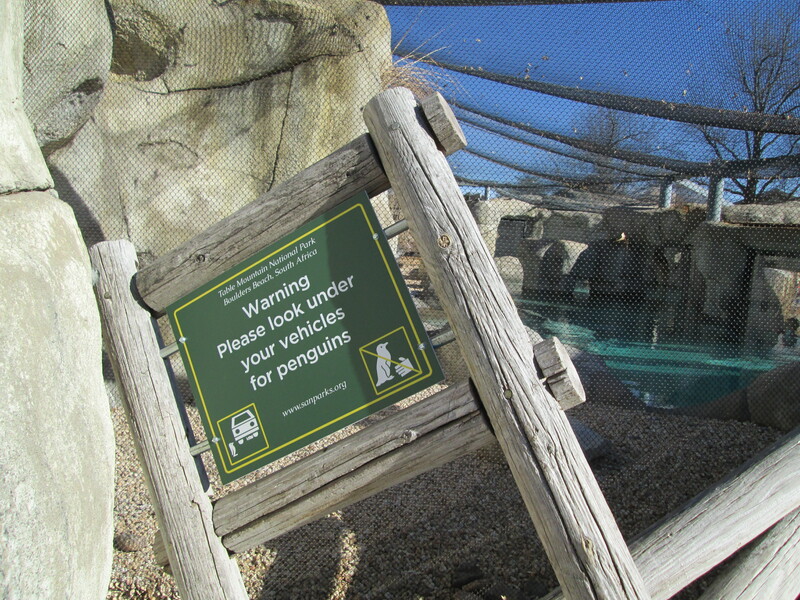 It was set up outside of the penguin exhibit at the Tulsa Zoo. 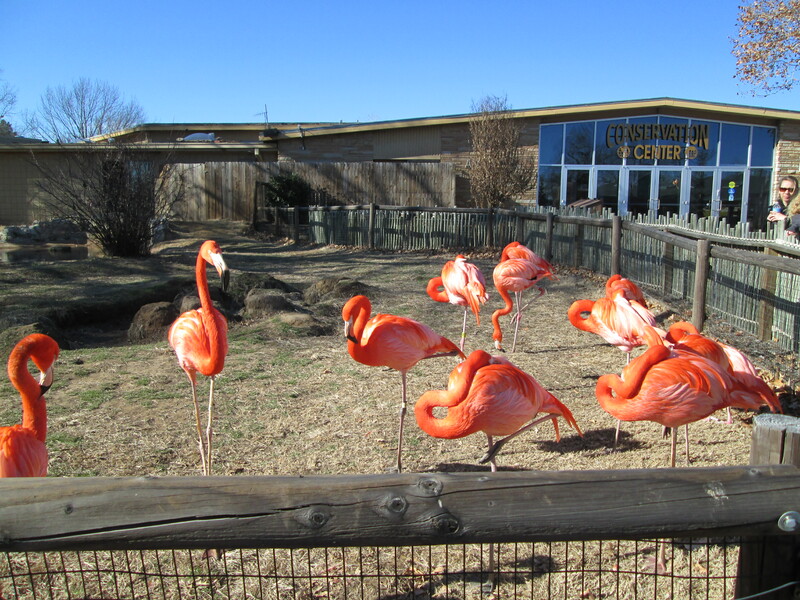 The Tulsa Zoo is a sprawling complex with a large variety of animals. Be sure you have on comfortable walking shoes! The exhibits include the “Walk on the Wild Side”, which are four buildings which explore the biodiversity of he North American continent. There is also the Amazon Rain Forest, the Conservation Building with primates and birds and the Chimpanzee Connection. 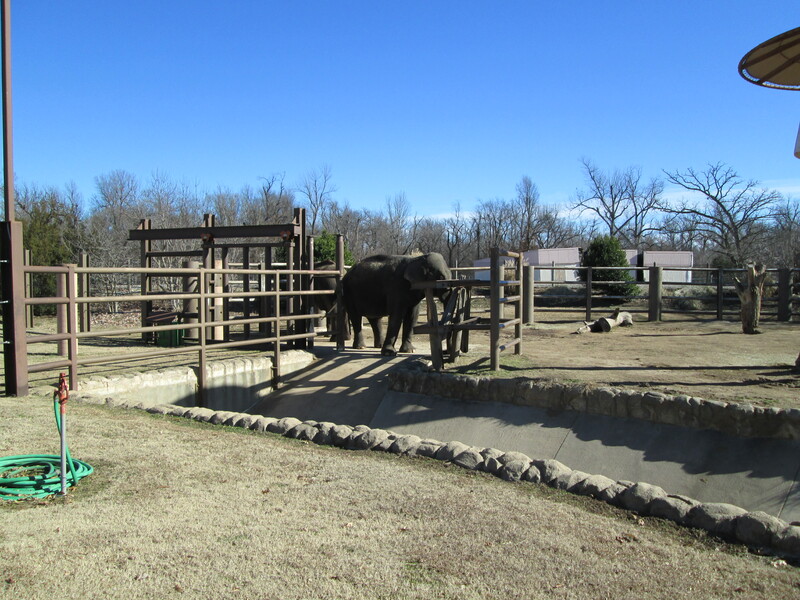 The outdoor exhibits, for the most part, give the animals room to roam and attempt to replicate their natural environment. 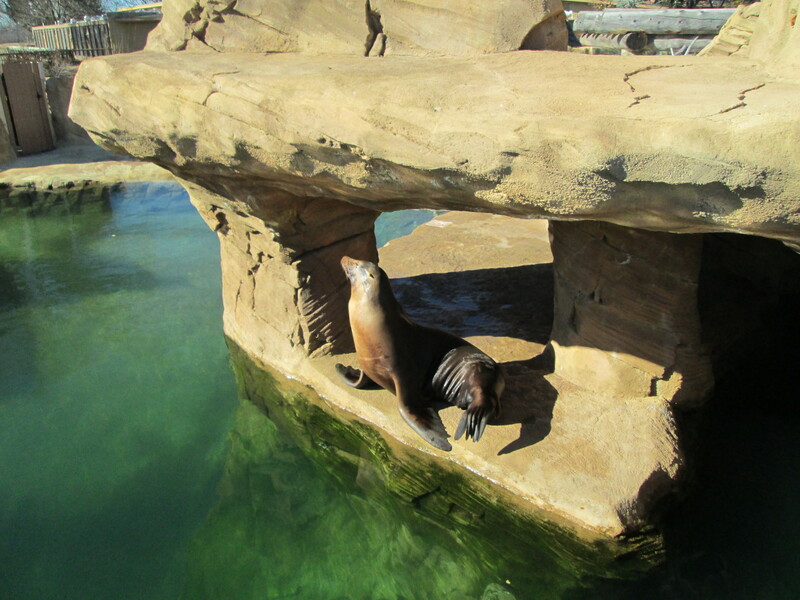 These include the African grasslands (rhinos, African wild dogs, giraffes), a penguin exhibit and the Sea Lion Encounter. 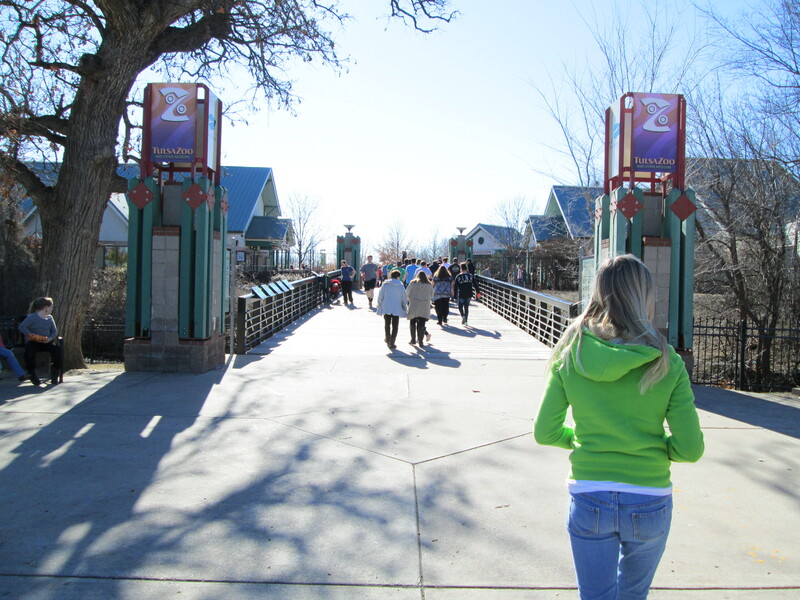 The zoo also features an African lion, a tiger, grizzly and black bears and many more wonderful exhibits. There is also a children’s zoo and multiple areas to eat. The kids will love the train and the carousel. 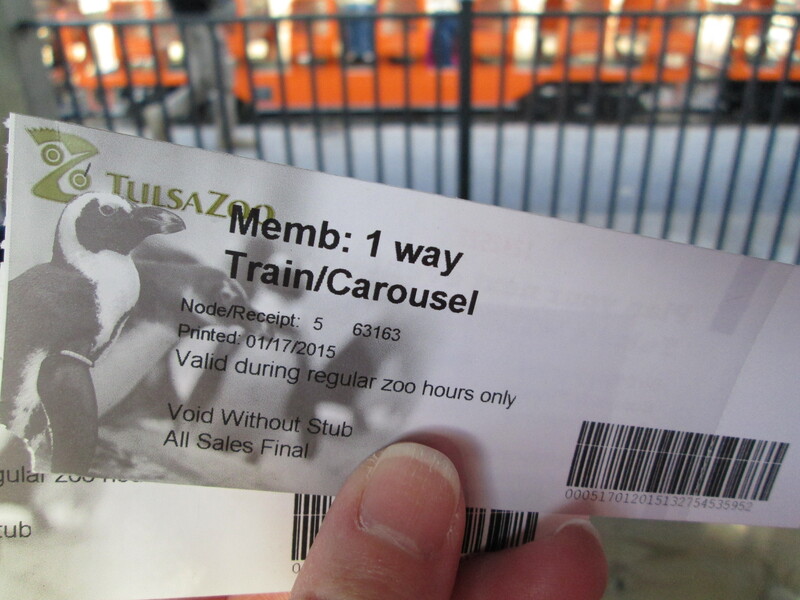 The zoo offers a reasonable membership which easily pays for itself within several visits. This is definitely worth the visit if you are in the area. 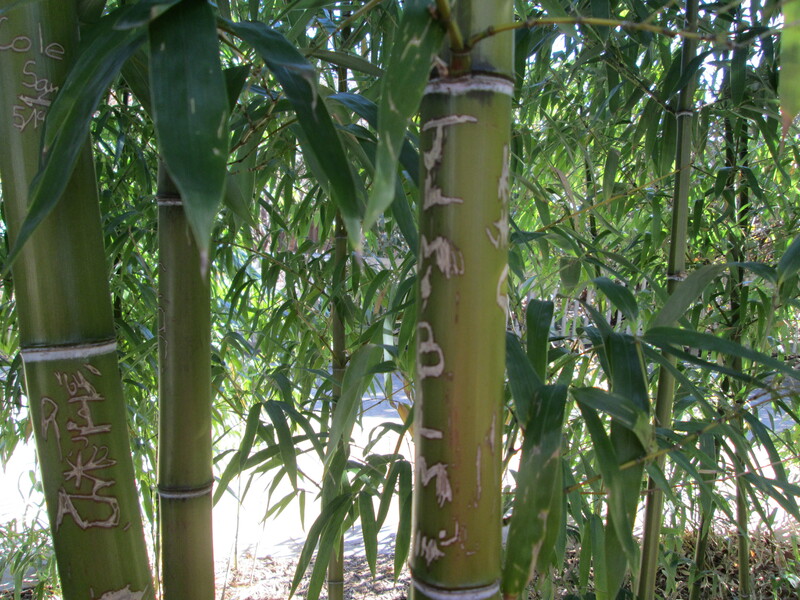 I think someone though they should autograph the bamboo trees by the elephant exhibit. Watch out for crossing penguins! 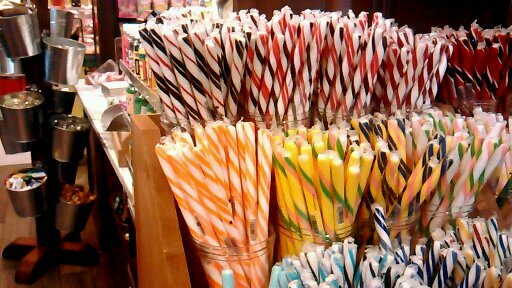 In truth, they were safe and secure behind glass. The welcoming entrance to the zoo. What? I am grateful for my journal. Yes, I know that sounds weird. 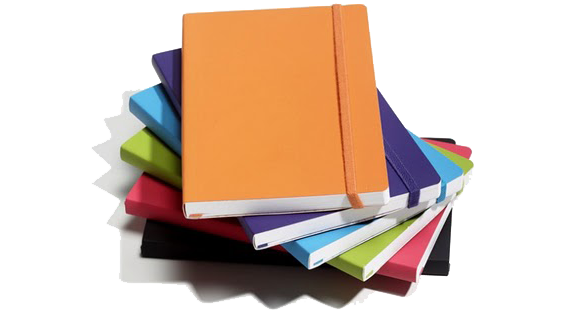 I have a great many things I am grateful for, but my journal is where I can pour my heart out, and not offend anyone. It is my release. My stresses, my worries, my total exhaustion at the end of a really really bad day (or of course my joys at the end of a very uplifting day). A lot of my journal writing is related to my work as a nurse. It is very hard to describe the roller coaster ride of feelings I can have in just one day of work. Sometimes I feel like I will burst at the seams if I do not share what happened or vent to someone. My journal is a way of letting those feelings flow, without compromising my patient’s privacy, and it really does make me feel better. 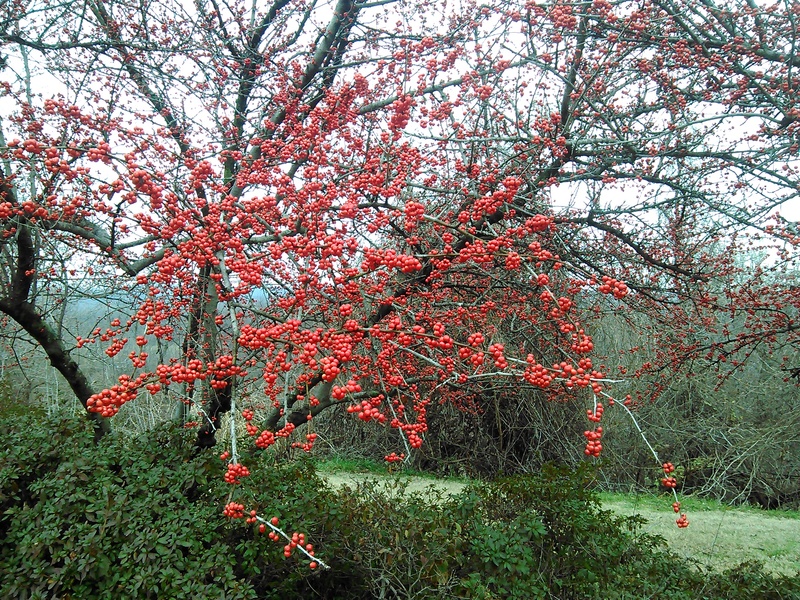 See the original gratitude posting at http://collinesblog.com/2015/01/14/grateful-for-short-distance/. I am grateful for work. Of course my work as a nurse, that allows me to put a roof over our heads and food on the table. It is work that can lift a person’s spirits and assist them in getting well. That is the most obvious work. There is also the work of mothering. My work of mothering has been a work in progress for almost 30 years now. It is by far my most challenging work but the most rewarding. I am grateful for the work of everyday chores; simple and often mundane, that keep me grounded. The work of living, that continues on until it is our time to leave this earthly existence, always forcing us to change and grow with it. As I move into the end of this week, I am grateful for the many kinds of work that enrich my life. I took my teenage son and preteen daughter to the canyon last year. 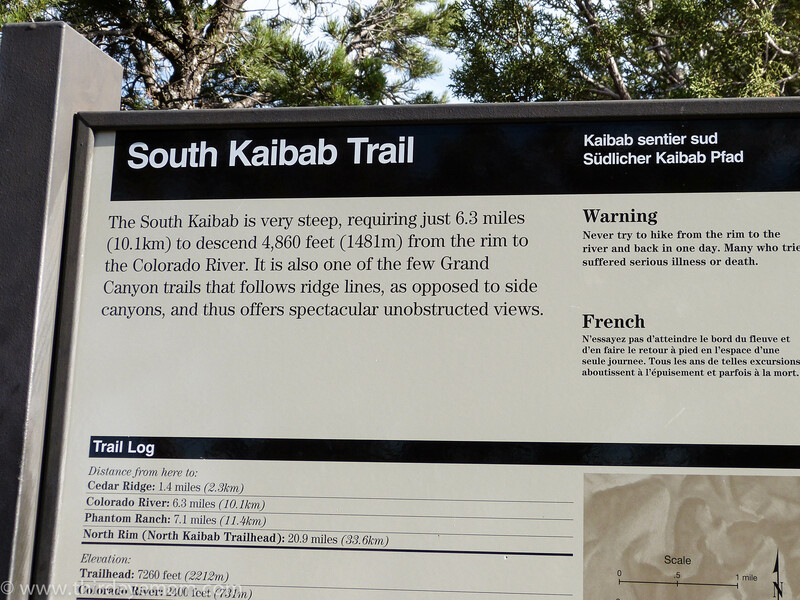 I wound up becoming frustrated since I really wanted to walk down the one of the trails , but my teenage son was so scared (!) of going anywhere near the edge that we had to stay on the main path at the top of the rim. I love traveling with my kids, but I really want to go back sometime when I can hike down into the canyon! My preteen was not nervous at all! I know the canyon can be frightening when standing at the edge, and all the encouragement in the world couldn’t get my son to go down a hiking trail! Happy New Year: 10 Good Luck Foods to Eat. According to their website, the Gilcrease Museum in west Tulsa houses the world’s largest collection of western art and artifacts. 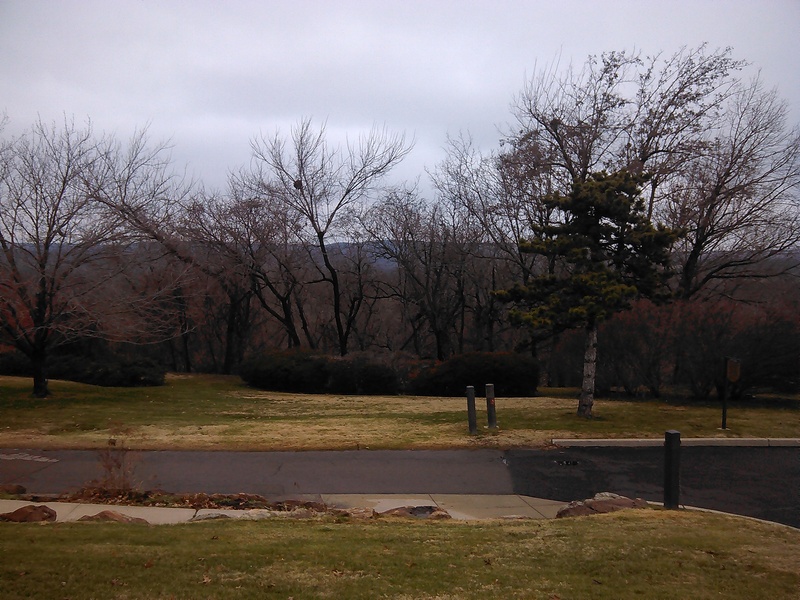 The museum is in an area of Tulsa which offers amazing views from atop the hill on which the museum is located. As you enter the beautifully landscaped grounds, you will see a variety of bronze sculptures, along with seasonal gardens. This time of year things were a bit bare, but it was still peaceful, with the birds singing the woods beyond the museum. Inside, we were greeted by a large Christmas tree in the lobby. As we headed into the museum, my daughter and I picked up some activity backpacks which are free of charge and come in several different themes. We enjoyed a variety of galleries, along with a special hands on area for children which focused on the ancient civilizations of Central and South America. There was a fossil dig, pottery shards to examine, and other related crafts. We also sat and sketched in one of the galleries. True to the museum’s claim, they had a large variety of western art and bronze sculptures. 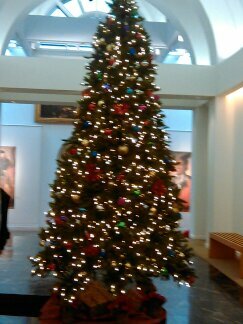 It was nice and warm inside the galleries, and we learned a lot about western art from the informative backpacks and information cards which were available around the museum. I would not recommend it for young children, unless they are in a stroller (there are strollers available for free), as the guards seem to eye small children very carefully. If you do keep them in a stroller, the children’s area is a wonderful place to let them run around. All in all, a very nice way to spend a cold, drizzly day.